DEBORAH CROMBIE: One of THE most exciting things for an author in the life of a book is the day you get to show the world the cover! So here is the first look at A BITTER FEAST, Kincaid/James #18! I absolutely love it! I think it perfectly conveys the beautiful but ever so slightly sinister feeling of my Cotswold village in the story. The wash over the artwork is a shimmery metallic gold and I think it's going to leap off the book displays. I hope you like it, too! I hope REDS and readers are looking forward to the release of A BITTER FEAST on October 8th, 2019 as much as I am! So, dear REDS and readers, do you like a book cover to convey something about the story, such as setting? Will you pick up a book by an unfamiliar author simply because the cover intrigues you? (I most definitely will.) And how much does the cover influence your online picks? 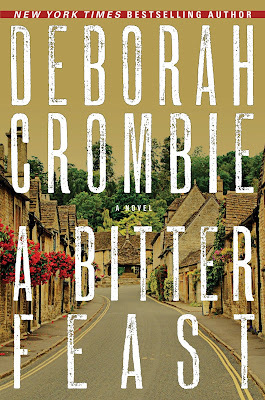 I love the gorgeous cover for “A Bitter Feast” and I can’t wait to read the book . . . . I definitely like books with covers that tie in with the unfolding story in the book; sometimes a cover will grab my attention and I’ll pick up a book just because of the cover, but I must confess that I tend to look for books by the author rather than the cover . . . . Yes, the cover does influence my decision, although usually that's for an author or book I've never heard of. But I will pick up a good and find out what it is about before I buy it. So the cover isn't the only thing I consider. Oh Debs, I love this cover so much! It is perfect in every way--the picture, the colors, the large lettering over the picture. And, I can't wait to the shimmery metallic gold overlay. Beautiful to the max! Covers can catch my eye and cause me to pick up a book for sure, but it has to be a book I want to read, too. I have so many wonderful authors who I follow that I choose more books by who wrote a book than by anything else these days. But, I am also a collector of covers I love, so I sometimes buy both copies of an author's book that published in the UK and in the states. I try to have a yearly list on my blog of my favorite covers for the year, too. Covers will make me pick up a book. Sometimes, if the cover is catchy but the plot doesn't really sound like my thing, a cover will cause me to pick up a book every time I walk into the bookstore. I'll think, "Oooo, cool cover!" read the jacket and think, "Oh, yeah, this is the one about the decapitated children," and put the book back down again. But if the cover catches my eye, the plot sounds intriguing, and the writing style is passable, a good cover will often make me take a chance on a new author. I'm going to say, up front, you won't be taking any chances if you pick up this book. The cover is so cool it will stand out amongst all the brooding blues on the mystery shelf; the plot is strong, and the writing style is Deb's distinctively smooth, compelling voice. My advice is to spot it at your local store, buy it immediately, and then set aside a long day where nobody is allowed to bother you, so you can feast on it, gobbling it all down at once. You won't be sorry, and it's calorie free! At least I know better than to refer to it as "Crombie's effortless prose." It's just that you make it look easy. Fabulous cover, Debs! Of course covers attract me, and I must say, Kensington Publishing does such a great job with their cozy covers. Can't wait to read the new book! Love that cover. Covers always affect the way I feel about the book, going in, though it's always the writing in the end. Cannot WAIT for #18. Sadly, for me anyway, while the cover of a book might intrigue me enough to pick a book up off the shelf to look at it, it doesn't play much of a role in deciding whether or not to pick it up. This would mostly refer to authors that are unknown to me as I'm generally going to pick up new books from authors that I already read. But for "new" or NEW authors, the book cover doesn't make me want to buy a book. Flipping the book over and reading the back cover is what has always and will always be the deciding factor on my book purchases. Great cover, Deb, and I just checked, found I'd ordered this back in December. I can wait until October. What great timing, publication just before Bouchercon. Thank you for directing me to the Cotswolds when I was in England last fall. I love seeing your pictures and comparing them with mine, both so much alike, same scenes in Lower Slaughter. But nothing compares to being in Nantwich and having a natter with Duncan's parents! Congratulations on bringing this newest book to fruition. I know now hard you work to get every word just right. And your branding is exemplary. I can recognize one of your books from fifty feet, which is more than I can say for most. Yay, Ann, so looking forward to you and Melinda being there! And thanks for pre-ordering. That makes so much difference. Most readers probably don't know that the pre-orders can effect the book's print run. I love the cover! And I am definitely one that will pick up a book based on a cover. First of all, cannot wait for this book - so ready for my next Duncan and Gemma (and Melody) fix. Cannot wait - did I say that? Ha! I love covers and even though I read a lot of books in e-format, I still love to peruse covers. I will buy a book by a favorite author regardless, but sometimes I say to myself - tragic cover. Trends in covers are funny and can get rather tiresome. The headless or half-head woman, the woman walking away, I'm tired of those. The gold-ish tone on this one is just right and the village street. Love it. Kay, I could just see you shaking your head and saying, "Tragic cover." So funny, and I so agree. I absolutely love the cover! I'm looking forward to the book even more now that I've seen it. Yes, a lovely and/or intriguing cover will catch my eye in a bookstore, and sometimes it will even motivate me to buy the book, depending on the descriptions, blurbs, and possibly reading a little sample. Oh Debs, how can you even ASK if we're looking forward to the release as much as you are? 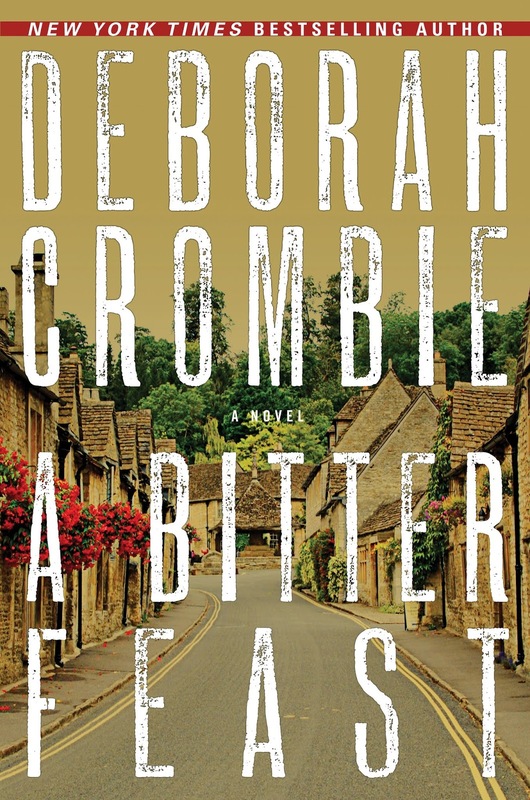 A Deb Crombie release day is always a red-letter day in my life! And yes, the cover is gorgeous. I feel out of sync with all the previous commenters. Certainly there is a part of my reading that is driven by following quite a few authors and reading a lot of reviews. But I have an audiobook downloaded to read in my car while driving at all times, so I frequently go to the library database and browse "Available Now." The cover displayed on that search page makes a huge difference in what I choose. Like others, I won't read a book only because it has a great cover. But I decide which ones to click on and learn more about based on only two factors, really: is it an author I know, or does the cover grab me. Dazzling cover for a dreary (weather-wise) morning! October!!! Waaaah! As Gigi pointed out, when I get my hands on this book, get out of my way! Shutting myself in my bedroom--no kids, no cats, no calls--and if the power goes out, I have a flashlight! A cover that catches my eye will definitely cause me to pick up a book by a new author, although whether or not I read it will depend on the jacket copy--does it sound like an interesting story well-told? And those covers du jour--nah, those won't even get picked up. The cover is amazing and...it speaks to the GREAT writing inside. Congratulations!!! By the way, I'm okay with October as I still need a little time to catch up to #18. Great cover! The gold shimmer makes it shine next to all the dark blue and black thriller covers on the shelf. Congratulations. Reading your Cotswold novel will bring back lots of happy memories. I love this cover Debs. It reminds me of my travel in the Costwolds and I'm so looking forward to A Bitter Feast. I intend to get mine at Bouchercon and get it signed by you before wallowing in the pleasure of reading it. Sometimes a cover will catch my eye but it won't necessarily bring me to buy it, the description will and a favorite author will too. Thanks, Danielle! So looking forward to B'con! My favorite thing is that dark doorway at the end of the street, smack in the middle of the cover. Draws me in. And gives me stomach butterflies. Can't wait to get my hands on A BITTER FEAST. I agree, Hallie, that is fab!! Oh, oh, oh. Love the cover. Love the summary of the plot. Preordering right now. Congratulations! I love it! And, yes, I would pick this one up even if I wasn't familiar with the author. Which I am even though I was a late starter I will get there. Can't wait to read A BITTER FEAST! Debs, I would buy your books even if they were covered in recycled brown grocery bags! I don’t generally choose books by their covers but I might pick up a book with an intriguing cover, and read the jacket and blurb. If it sounds appealing then I will purchase it/borrow it from the library. With favorite authors, all I do is see the author’s name, grab the book and rush to the checkout! Such a long wait until this book is available! At least a new book by you will make autumn seem less intolerable! Can't wait, Debs! And adore the cover. Oh, thank you all so much! So much thought--and argument, sometimes, goes into book covers! I have loved the design of the last five books--that's the font used, as well as the placement of the name and title--I think we've got a great and very recognizable look there. But with this one I was glad to get back to something a little less abstract with the art. And I do LOVE this photo, with its quality, as Hallie says, of drawing you in, and I think that the sky not being blue makes it just a little foreboding. The art department at Harper Collins has done a great job! Oh, three days after my birthday . . . thanks! It will add to the celebration of another trip around the sun. I'm already intrigued, by cover and description. You are such a rockstar! I do not know how you do it… And this cover is luminous and gorgeous! Yay! Fainting with delight at the prospect of reading this… Love you so much! Thank you, Hank!! I do think it's luminous. So excited! And the winner of Elisabeth Elo‘s book is: Triss! Email me your address… Yay! AND the winner of S.C. Perkins book is Coralee Hicks! Email me your address at deb at deborahcrombie dot com, Coralee. I'm reading Perkins' book now. Ordered it the day I read about it here on JRW, and the first page just grabbed me. You'll love it, Coralee! So happy. Life is good. Love the cover! I will pick up a book by an unfamiliar author if the cover calls out to me. With known authors the cover is not critical. But it sure is nice when it's a winner anyway! I have to admit I buy a lot of books online, but even scanning Bookbub every day, the cover is usually the first thing to draw me in. Also, I go to my nearest B & N at least once a month for my British magazines, and I always look at all the new book releases and think about the covers. Last year I bought Ann Mah's The Lost Vintage because I adored the cover, and it was one of my favorite books of 2018. I heard about The Lost Vintage from you all and it has been one of my favorite books of that year too. Fabulous cover and enticing title = Slam Dunk! Have ordered my copy and can't wait to have it and see it displayed prominently in the stores. Deborah, congratulations on your new book! I look forward to reading Bitter Feast. When I was studying abroad, our class visited a house in the Cotswolds. This elderly lady was kind enough to show us her house. It had been in her family for 500 years! For me, I would read a new to me author based on recommendations from bookstagrammers. I would read book reviews then decide if it sounds like a book that I would want to read. I am so bad at remembering titles! Love the cover of your new book! Wow, stunning cover! In anticipation of October 8th, I am re-reading the series. Five-ish months left, and 10 books to go. It's like visiting with old friends. Beautiful!!! It is absolute perfection! I think covers are SO important, which is the opposite of what JD Salinger believed. He felt they took away from the story and should be plain with the title and the author’s name and that’s it. But I feel the cover art is one more reason to appreciate a book and yours is spectacular, Debs! Congratulations! A cover like that might as well be called "Generic Book." I am more a title than cover girl. I think it is because the cover doesn't always match the books content. After shelving so many books, the covers tended to blend together. That being said, This cover will stand out, I think the gold wash is inspired. Counting the days until A Bitter Feast is in my hands. Sounds fabulous, Debs. And what a gorgeous cover! Love your covers, love your titles, but mostly, I love your writing and characters, Debs. This is one stunning cover, for sure; icing on the delicious cake that is your next Gemma and Duncan installment. I am licking my lips in anticipation! I love the cover to A Bitter Feast. I am a very visual person and am defintely am drawn to visually pleasing or interesting book covers, whether I am familiar with the author or not, and I will definitely check it out. I'm not a fan of the cartoon book covers, and usually skip over them especially online. Congrats on the new book -- I look forward to October! ohhhhh Debs, it's a wonderful cover!!! Pre-ordered, of course! Book covers are important to my choices when it comes to browsing around in a book store or on-line without a particular author in mind. This is a cover that would definitely bring me back for a second look - it's quite classy, subtle and with a bit of mystery. LOVE, love, love the cover, pre-ordering today! I can hardly wait to hold that book in my hands. This summer I'll reread all 17 of your Duncan/Gemma gems, so that I am totally in the zone when this one arrives. Love the cover, and I can tell by the description this is going to be one of those books I have to stop reading to make something to eat due to the mouthwatering depictios of food. Julia, I'm lucky I didn't gain a hundred pounds WRITING this book! A new book about Duncan, Gemma, and their extended family and friends is always special - well worth the wait! Yay! Shalom Reds and fans. I would buy and read this book, (A BITTER FEAST), no matter what the cover looked like. A confession: I have almost completely stopped going into our local bookstores. Even the two used bookstores here in town. I can’t afford the books I would long to buy. And I have no space for them. However, I do still use two libraries’ ebook and audiobook services. Also, I buy a lot of books sold by Amazon or eBay. Many are hardcover at a really good price even with shipping. The Garden of Lamentations was the exception to the rule. I bought the e-book and the connected audio version, the day it hit Amazon’s online bookstore. That all having been said, I do think that covers have a subliminal attraction for me. This past autumn, in New York City, the Jewish Book Council, had a fire sale on books. It cost me $30 in bus fare and $25 in cash at the door. I brought two vinyl shopping bags and filled them with 18 books. In a relatively small room, they had piles and piles of books on tables. There were scores of people all with the same intention. TRUST ME was on one of the tables. I knew that cover. I snapped it right up. All the other covers and most of the authors were new to me. I favored the hardcovers but not completely. I came home with equal parts fiction and non-fiction. Among the non-fiction, I looked mostly to try and figure out the topics that were of interest to me. I would read the cover blurbs to try to get the feel of the book. There were mostly Jewish authors or Jewish topics. I do try to avoid graphic sexuality and/or graphic and gratuitous violence. Looking at those covers today, I realize they are all relatively well-done. Mostly though, it is impossible to really judge the cover and the title until after you have read the book. Pining for October. Perhaps I will reread the series. I know the storyline but I would be hard-pressed to tell you the plot of each individual book. Although I buy my favorite authors' books even if the covers are ugly or blah, I really love bright colorful covers. If I'm picking new books, the cover is the first thing to draw me in. Of course I look at the back cover and even page through before buying. I like covers that do relate to what is in the book. I do favor animals, food, gardens, and scenery. Covers definitely get my attention, but for new to me authors it's really the blurb that determines whether or not I'll want to read it. I can't wait to read your next book. I have them all. Like most everyone else, the cover and inside page is what draws me in if it is a new author. With an author such as yourself, I know that I will love it so the book cover is not important. With that said, your cover is exquisite. I LOVE this series! Congratulations. The cover is gorgeous. I swear, I've been to that town. I think cover art is hugely important. I know that as a reader, I'll pass or play on a new book, depending on how the cover strikes me.